CHICAGO (AP) When Joe Serpico closes his eyes, he can go right back to that day in 1961. Serpico’s big Italian family gathered for cake and coffee for his 10th birthday. On a table full of presents, there was one unwrapped Wieboldt’s department store box from uncle Jerry ”The Barber” Del Giudice – a pair of game-worn jerseys from Chicago Blackhawks stars Bobby Hull and Glenn Hall – a moment of pure joy that stayed with Serpico forever. Serpico, 66, wore the Hull jersey when he touched the Stanley Cup a couple years ago – a surprise present from one of his daughters – and something changed. 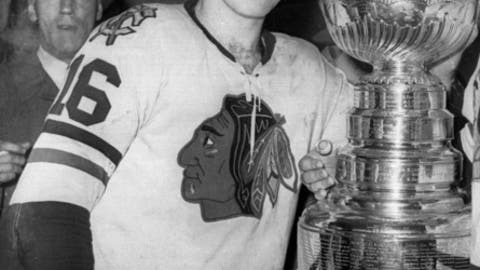 Heritage analyzed Serpico’s jersey – looking at the numbers, the fonts and other parts of the sweater – and determined it’s from the 1958-59 season, Hull’s second year in the league. Hall asked Serpico to try on his No. 1 sweater one last time, and the Hall of Fame goaltender later sent Serpico a hand-written letter thanking him for being a fan. Hull’s No. 9 was retired by the Blackhawks – like Hall and No. 1 – but the jersey up for auction is No. 16, which Hull wore for a short time at the beginning of his career. And Hull was impressed by Serpico’s knowledge of the numbers from his career. ”Bobby looked at me and he started laughing. He’s like `OK, so you do remember a lot of the history,”’ Serpico said. While the Hull jersey is heading for another home – ”I don’t even know if I’ve done the right thing about it,” Serpico said – Hall’s sweater is staying put. Probably forever. ”My son’s comment … if he was here, he’d tell you `My dad’s going to be buried in that jersey and only that jersey,”’ a chuckling Serpico said.